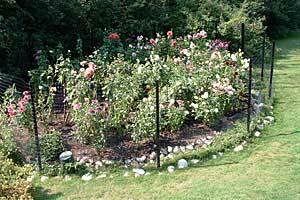 This unique “Invisi-Style” Quick Fence System protects your garden from uninvited guests. Now there’s a better way to keep animals out of your garden and protect your flowers and plants from pest animal damage. Jaguar Fence offers the first complete and simple fencing solution for vegetable and flower gardens. The innovative Jaguar Fence System is a great value. It provides an effective, easy to install, attractive and built-to-last garden enclosure solution! Complete fence kit in a box with all components including entrance gate, stake driver, leveling guide, and more. Elegant look and “invisi-style” appearance (green posts and stealth black fence fabrics); this fence is really hard to see from a relatively short distance. Standard Garden Fence Kits – Includes everything needed for a 3 1/2’ high barrier. Features heavy-duty black plastic fence fabric and Easy-Gate access. Available in 50’ & 100” lengths. Effective as a barrier to rabbits, skunks, and deer under certain situations. Deluxe Garden Fence Kits – Includes everything needed for a 3 1/2’ high above ground barrier plus a 6” below ground anti-burrow barrier. Features 4’ black vinyl coated metal fence fabric and Easy Gate access. Available in 50’ or 100’ lengths. Effective as a barrier to rabbits, skunks, woodchucks, and deer under certain situations. Standard Deer Fence Kits – Includes everything needed for a 6’ high barrier with heavy-duty black plastic fence fabric and Easy-Gate access. Available in 100’ length. Effective as a barrier for deer, rabbits, skunks, and raccoons. The Jaguar Fence System is available in many independent garden centers, home centers, and on the web at www.gardenfence.com.